The Opposition alleged in the Rajya Sabha today that POTA had been used in a biased manner, especially in Gujarat. However, the Deputy Prime Minister, Mr L.K. Advani, ruled out any interference in the working of the review committee, which has been set up to look into the allegations of misuse of the Act. The security of the “Ramlalla” seated in the “Garbh Griha (sanctum sanctorum)” at the disputed site in Ayodhya has been tightened in view of the ongoing excavation work and the Ramnavami fair on Friday, the police said today. In what is being seen as the emergence of a power centre in the party, BJP General Secretary Pramod Mahajan succeeded in blocking the passage of a party constitution amendment at the recently held party National Executive meeting in Indore. The government issued grant-in-aid worth Rs 190.30 lakh to Punjab during 2002-03 for the eradication of blindness in the state, the Health and Family Welfare Minister, Ms Sushma Swaraj, said in a written reply to the Lok Sabha today. Prime Minister Atal Behari Vajpayee is likely to unveil the portraits of Master Tara Singh and Baba Kharak Singh in the Parliament House complex here. 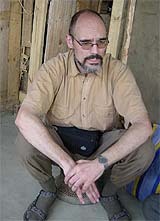 German aid worker Heinrich Wolfgang sits in Imphal, capital of Manipur, on Wednesday after tribal rebels released him. Wolfgang was released after he was kidnapped on March 21, the first such capture of a foreigner by rebels, who are demanding more political autonomy. Allies’ sprint to Baghdad an Iraqi ploy? The Centre said today that it was willing to introduce a Constitution Amendment Bill in the current Budget session of Parliament, paving the way for enforcing the small-family norm for legislators and Members of Parliament, if there is a consensus on the issue. The Delimitation Commission on Punjab held its first meeting here today which was presided over by Mr B. B. Tandon. Chairman of the Delimitation Commission Justice Kuldeep Singh was not present. President A. P. J. Abdul Kalam today expressed concern at the high debt burden and said both the Centre and states needed to address the issue through better financial management for achieving higher economic growth and poverty reduction. “Many states are burdened with debt. Taking note of the alleged physical assault on CPM members in Kerala, Lok Sabha Speaker Manohar Joshi today told the House that he had sought a "factual note" from the Union Home Ministry on the issue. The Bihar Minister of State for Excise, Mr Surendra Yadav, today quit his post and went underground in the wake of non-bailable arrest warrants for him in connection with the kidnapping of police personnel and a businessman. The Shiromani Akali Dal (Amritsar) President and Lok Sabha MP from Sangrur, Mr Simranjit Singh Mann, has requested the Prime Minister to visit Vellore and see the prison conditions where MDMK leader and fellow parliamentarian, Mr Vaiko, has been lodged. The Congress yesterday accused the Vajpayee government of complicating the Bhojshala issue and dividing people on sectarian lines. Congress chief spokesman Jaipal Reddy said that the Centre was playing a negative and divisive role and its stand on the issue was politically motivated. Congress President Sonia Gandhi has assured Punjab Pradesh Congress Committee Vice President M M Singh Cheema that the youth, mahila and NSUI wings of the State unit will be reorganised soon. For the first time in the Indian film history, a Bollywood star, Aishwarya Rai, has been invited to become a jury member of the Cannes International Film Festival commencing May 14. 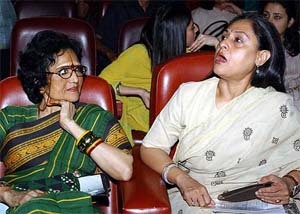 Jaya Bachchan delivers a keynote in a seminar on women, cinema and society at the FICCI auditorium in New Delhi. The Centre for Electronics Design and Technology at the Indian Institute of Science and the Biel School of Engineering and Dasag Energy Engineering of Switzerland have jointly developed a prototype of the Hybrid Electric auto rickshaw. "Kurta," a traditional attire, is becoming a preferred fashion statement. The Opposition alleged in the Rajya Sabha today that POTA had been used in a biased manner, especially in Gujarat. However, the Deputy Prime Minister, Mr L.K. Advani, ruled out any interference in the working of the review committee, which has been set up to look into the allegations of misuse of the Act. 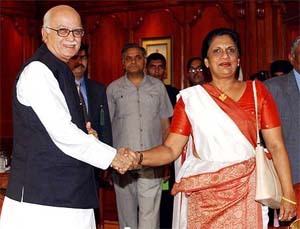 Ms Shabana Azmi asked Mr Advani whether it was true that many were booked under POTA for the Godhra carnage but no one was arrested for the “bloodshed” that followed in Gujarat. This led to allegations of misuse of POTA by many opposition members with Mr Manmohan Singh (Congress) questioning the reason for a change in the government affidavit in the Supreme Court on the issue of arrest of MDMK leader Vaiko under POTA. “You should not expect me to usurp the authority of the review committee. I have taken cognisance of the allegations,” Mr Advani said replying to supplementaries during question hour. “I am sure this review committee will take a comprehensive view of the entire gamut and even make recommendations if it feels so,” he said. The Centre has not referred any case to the committee, he said. Despite repeated demand from the Opposition on the time frame within which the committee would submit its recommendations, Mr Advani did not give a direct reply to the query. The Deputy Prime Minister said consultations between the Centre and the state government had increased after the formation of the Mufti Mohammad Sayeed government in the state. He said as per ministries/departments concerned, a sum of Rs 346.75 crore had been released so far during 2002-03 towards implementation of the PM’s special package for Jammu and Kashmir. This includes Rs 236.45 crore for Railways and Rs 100 crore for the Border Area Development Programme, he said. Superintendent of Police Rajendra Singh apart from the normal police force, an ASP, three DSPs, 20 sub-inspectors, two inspectors, five companies of the CRPF and one company of women RPF have been deployed. A secret police force will also keep a watch around the disputed site. Several security personnel also were deployed at the Hanumangarhi, Kanak Bhavan and Nageshwarnath temple. All vehicles passing through the city on April 11 would be checked. At least 15 lakh devotees are expected to attend the Ramnavmi fair here on Friday. NEW DELHI: Final arguments before the Liberhan Commission, probing the demolition of the disputed structure at Ayodhya, could not take off on Wednesday as the Centre sought more time to file written submissions. Allowing a request by Centre’s counsel Lalaram Gupta that he needed time to study the “voluminous records” before filing written arguments, the commission adjourned the matter to April 21 and 22. Earlier, on March 7 the commission had given the last opportunity to the parties - including the Centre and Uttar Pradesh Government - to file their written submissions and commence the final arguments. However, none of the parties filed written submissions and some of them, including the All-Indian Muslim Personal Law Board, complained that they were not given all documents and statements of the witnesses. The commission on that date had also directed that the parties be supplied with copies of statements with in two weeks and had asked the Centre to initiate the final arguments. When contacted, the commission sources said they were in the process of providing the documents to the parties. The commission of inquiry has entered a crucial phase with the recording of evidence having concluded on January 22. The Allahabad High Court today reserved its order on the Archaeological Survey of India’s petition seeking two more months for the completion of excavation at the disputed site at Ayodhya, even as it asked authorities to explain why its order to engage adequate number of Muslims for the digging was not complied with. Mr Mahajan reportedly opposed the passage of a proposal amending the party constitution pertaining to doing away with the election of all office-bearers but for the president from the district level downwards, was introduced at the executive meeting by Mr O.P. Kohli. The amendment was drafted by a five-member committee set up by party President M Venkaiah Naidu. The committee members were Mr O.P. Kohli, Mr Kalraj Mishra, Mr Raj Nath Singh, Mr Pyarelal Khandelwal and Mr L Ganeshan. Soon after Mr Kohli introduced the draft, which sought amendment to the constitution where by from the district level downwards only election be conducted for president and other office-bearers be nominated by the elected president, Mr Mahajan opposed it. The former Parliamentary Affairs Minister argued against the amendment saying that doing away with the elections for the office-bearers at the grass-roots level would serve a big blow to the vibrant democratic set up of the party, sources said. Doing away with the elections would also mean allowing room for persons elected as president to select the office-bearers according to their whims and fancies, the sources said. As Mr Mahajan’s point of view was endorsed by a few other leaders present at the meeting, the BJP President intervened and thought it fit to set aside the amendment resolution till thorough discussion. Even as Mr Kohli maintained that “due to paucity of time the amendment resolution could not be debated upon”, a senior leader said the scuttling of the passage of the amendment reflected the assertion of Mr Mahajan in party affairs after having lied low for quite some time. The government issued grant-in-aid worth Rs 190.30 lakh to Punjab during 2002-03 for the eradication of blindness in the state, the Health and Family Welfare Minister, Ms Sushma Swaraj, said in a written reply to the Lok Sabha today. She said under the National Programme for Control of Blindness (NPCB) the amount of grant released was Rs 49.7 lakh to Haryana, Rs 62 lakh to Himachal Pradesh , Rs 84.3 lakh to Jammu and Kashmir and Rs 20.4 lakh to Chandigarh. The government has also issued guidelines on the utilisation of this grant directing the respective states to furnish monthly or quarterly performance and expenditure reports and furnishing the audited reports and utilisation certificates annually, the minister said. Under the National Leprosy Eradication Programme (NLEP), the amount of grant -in-aid released to Punjab was Rs 40.3 lakh whereas it was Rs 43.9 lakh to Haryana, Rs 30.5 lakh to Himachal Pradesh, Rs 96.4 lakh to Jammu and Kashmir and Rs 10.1lakh to Chandigarh, Ms Swaraj informed the house. The Minister of State for Small Scale Industries, Mr Tapan Sikdar, informed the house that Rs 190 lakh had been approved by the government for providing assistance to small scale industries in Punjab in 2002. As a part of the credit guarantee fund scheme (with a corpus fund shared by the government and RBI), the government extends loans to small scale units with an objective of extending guarantee covers for mitigating credit risk up to 75 per cent of the collateral free credits, the minister told the House. The government has ordered an enquiry regarding complaints of delayed delivery of money orders, Minister of State for Communications and Information Technology told the House. Responding to a query by Mr P.C. Thomas regarding the development of national highways, the Minister of State for Road Transport and Highways Mr B.C. 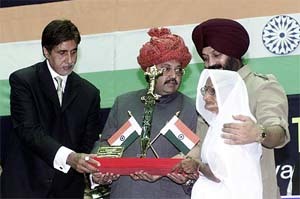 Khanduri, said Rs 5,176 lakh had been provided to Punjab in this regard during 2002-03,whereas the amount provided to Haryana was Rs 5,900 lakh and it was Rs 3,000 lakh to Himachal Pradesh, Rs 400 lakh to Jammu and Kashmir and Rs 270 lakh to Chandigarh. Lok Sabha Speaker Manohar Joshi conveyed this to Union Chemicals and Fertilisers Minister Sukhdev Singh Dhindsa, SHSAD leader Gurcharan Singh Tohra and National Commission for Minorities Chairman Tarlochan Singh when they called on him today to thank him for meeting the demand of installing the portraits of Sikh stalwarts and freedom fighters in Parliament House. Mr Joshi conveyed to them that he would urge Mr Vajpayee to be the chief guest at the portrait-unveiling ceremony. The Bill seeks to restrict persons having more than two children from contesting Assembly and parliamentary elections. “The Bill is pending before the Rajya Sabha and if there is a consensus among all political parties, we are ready to introduce the Bill in this session itself”, Union Minister of Health and Family Welfare Sushma Swaraj told the Lok Sabha. The Constitution (79th Amendment) Bill has been pending in the Rajya Sabha since the time it was placed in the Upper House in 1992. Mrs Swaraj said some states such as Andhra Pradesh had already enacted laws restricting persons having more than two children from contesting elections to panchayat or civic bodies. Sources said associate members from Punjab, all of whom were present today, were urged to prepare their proposals by May 19 when the Delimitation Commission for the state will meet again.Though the exercise is being done on the basis of the 1991 Census, there are demands to carry it out on the basis of the 2001 Census.The sources said draft proposals circulated among the members propose to raise the number of seats for the Scheduled Castes and Scheduled Tribes in Punjab both for the Assembly and Lok Sabha, elections. President A. P. J. Abdul Kalam today expressed concern at the high debt burden and said both the Centre and states needed to address the issue through better financial management for achieving higher economic growth and poverty reduction. “Many states are burdened with debt. The Union Budget also shows that one-fourth of the total receipts go for interest payments”, President Kalam said while addressing the golden jubilee function of the Finance Commission here. To achieve the objective of making India a developed country, he said it was imperative that the economy grows at the rate of 9 per cent annually. This would help the entire 260 million people living below the poverty line to improve their lot. Underlining the need for better connectivity through technology, IT and telecom, the President said these were critical for the growth of rural India, where two-thirds of the population resided. Raising the issue during zero hour, CPM member Suresh Kurup said his party colleagues T. Govindan, A.P. Abdullakutty, S. Ajaykumar and N.N. Krishnadas were "brutally beaten up" by the Kerala police during a demonstration held in protest against the police firing on tribesmen on March 17. He said the government had not taken any action. Mr Kurup said the House should seek a report from the state government on the issue. Waving his bandaged left hand, Mr Krishnadas said it was broken in the lathi charge during the demonstration. The Bihar Minister of State for Excise, Mr Surendra Yadav, today quit his post and went underground in the wake of non-bailable arrest warrants for him in connection with the kidnapping of police personnel and a businessman. Governor V.C. Pandey accepted his resignation soon after receiving it, Raj Bhavan sources said. Earlier, Mr Yadav tendered his resignation to Chief Minister Rabri Devi, who forwarded it to the Raj Bhavan for the Governor’s acceptance. Mr Vaiko has been in detention under POTA for the last nine months. He was detained by the Jayalalithaa government for alluding to his speech in Parliament in which he had supported the cause of the Tamil nationalism. The SAD (Amritsar) chief has made a formal request to Mr Atal Behari Vajpayee to use his good offices for the immediate release of Mr Vaiko and eight other leaders of the MDMK. To a question about Madhya Pradesh Chief Minister Digvijay Singh’s reported remarks that the issue would be solved when Congress President Sonia Gandhi became Prime Minister, Mr Reddy said that unless Congress came to power at the Centre the issue may not be solved. He said that the problem of Bhojshala had been deliberately raised by the BJP. Mr Cheema, who met Mrs Sonia Gandhi here today, apprised her of the general political environment in Punjab and underlined the need for gearing up the party organisation at the grassroots level for meeting the challenges ahead, including next year’s general elections. He drew pointed attention to attempts being made by vested interests in certain districts like Gurdaspur, Phillaur and Amritsar to reorganise constituencies for political gains. Confirming the selection, Aishwarya’s secretary Hari Singh said she had received the invitation on March 6. However, it was only four days back that she decided to accept the honour after correspondence with the organisers of the festival, he explained. Aishwarya will leave for Cannes on May 12. Expressing “extreme happiness” over earning the distinction of becoming the first Indian to become a jury member for the Cannes, Aishwarya said it was a proud moment for the Indian film industry. Elections to 62 cantonment boards across the country have not been held for more than a year after their terms expired, Congress member Suresh Pachouri stated in the Rajya Sabha yesterday. Taking up the issue as special mention, he alleged that the government wanted to place its representatives on these boards by not holding elections under the garb of proposed amendment to the Cantonment Act, 1924. Demanding that the government hold elections to the boards, he said elections should be held without waiting for the proposed amendment to the Act.